THE projected rise in sea level due to global warming and climate change is the kind of stuff that makes doomsday stories. The threat from such a rise has ominous portents for a large portion of the human population. Yet several scientists say that problems related to global warming may not be impossible to deal with. One very effective way to deal with the rise in sea level could be to create a buffer of mangrove forests along the coastlines, according to a paper published in the journal Canopy International (Vol 25, No 2). "Unless preemptive actions are undertaken, this will wreck millions of lives in various countries throughout the world," say the authors led by Honorato G Palis, who has been associated with the Bangladesh Forest Research Institute. "The devastation posed by sea level rise, however, is not a no-win situation. As seen by environmentalists, mangroves, halophytes that inhabit the intertidal portions of tropical and sub-tropical coastlines, can help mitigate, if not completely check such potentially catastrophic consequences," they add. The importance of coastal areas cannot be overestimated as 70 per cent of the world's population is in coastal communities and the most productive agricultural zones are found in or near coastal areas, the researchers emphasise. They point out that the Earth's surface temperature is expected to increase by 0.5C to 2C by 2050. "A 1C rise in global temperature is projected to be very probable by 2030. A 3C rise is predicted by the end of the 21st century. These upward changes in temperature can melt the polar ice caps and cause thermal expansion in the oceans. This will result in sea level rise," they note. The sea level has already risen by 20-30 cm over the past century. Computer simulations show an annual sea level increase of 2-7 mm. Projections point out that a rise of 20 cm in the sea level is likely to take place in the early part of the coming century. The results are expected to be disastrous. "In Bangladesh, for instance, the overloading of the Ganga-Brahmaputra rivers from the Himalayan headwaters will cover most of its accreted land including its capital city, Dhaka. Huge waterbodies, such as the Nile of Egypt, the Mekong of Indo-China, the Indus of Pakistan and the Yangtse and Huang Ho of China, will devastate their banks and coastlines," the researchers indicate. So, what can mangroves do for us? "Mangroves protect shorelines and riverbanks from erosion through their extensive and thatched root system that traps eroded soil. They can normally trap sediments at the rate of 1.5 cm to 2 cm a year. Moreover, the constant production of litter (mostly leaves), which leads to peat formation, also contributes to the gradual increase in the height of the compiled soil," the scientists note, citing several studies conducted on the matter. However, warn the researchers, "threats to the 17,000 sq km of mangrove areas worldwide endanger the buffering function of more than 600,000 km of coastline." 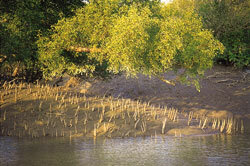 The authors recommend that the current state of mangrove forests ought to be maintained and improved. "Mangroves may save millions of lives when the wrath of global warming raises the sea level to catastrophic heights," the researchers conclude.